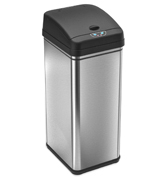 The trash bin is made of stainless steel with a nano-silver fingerprint-proof coating. 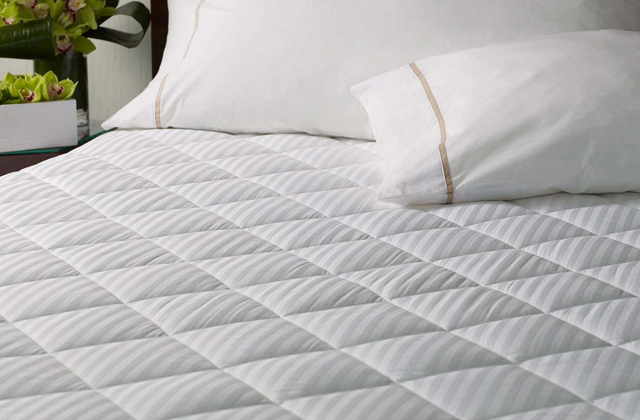 The former ensures the product's durability and the latter gives the model a sleek look. A liner pocket inside the bin dispenses the liners one by one, all while providing a nice little space for them. The liner rim flips down in order to secure the liner and hide its hideous edges from the outside world. The pedal may start to creak over time. There are a couple of things that define Simplehuman CW2024. First, there's the aesthetically pleasing design that will make it a good addition to contemporary and modern kitchen interiors. 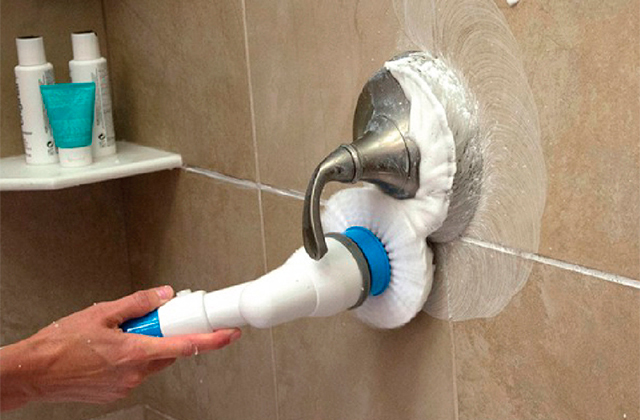 Then there are the additional features that make the product just a tad more convenient than the rest of them. 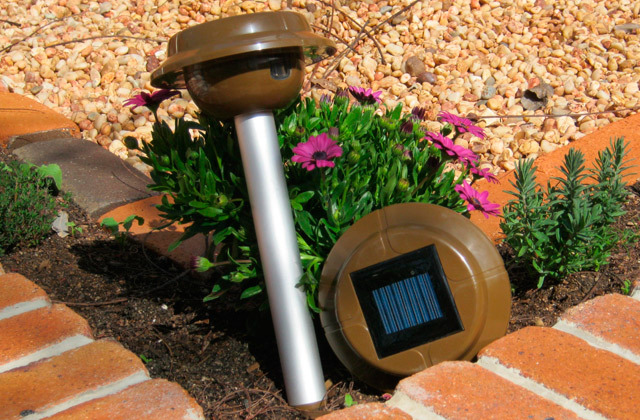 16" x 13" x 25"
The automatic lid comes equipped with motion detectors. Aside from the fact that this little detail makes your interactions with the bin a bit more comfortable, it is also a much more hygienic choice. The natural carbon deodorizer filter absorbs and neutralizes trash odors, so you will be able to enjoy a fresh and clean smelling home regardless of what kind of trash you have in your bin. The black top/cover is not easy to clean. What we have here is obviously not your run-of-the-mill kitchen trash can. 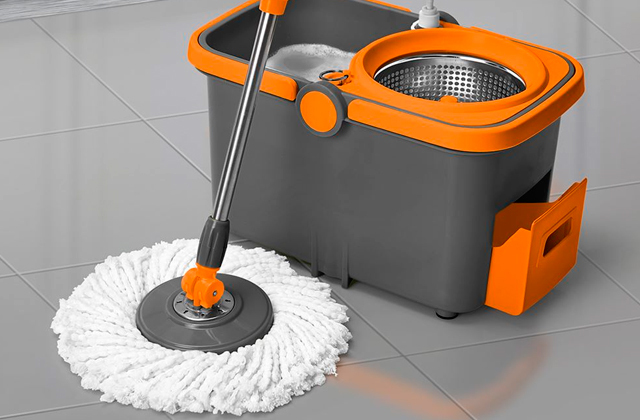 This is a high-tech model that brings the technological advancements to the element of your kitchen where you'd least expect it, making the necessary interactions with litter far less unpleasant and inconvenient. 10.8" x 12.8" x 27.9"
The oversized button on top of the lid conveniently springs that lid open, making way for easy disposal of litter. 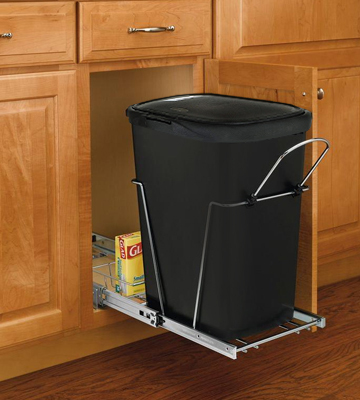 There's also a convenient liner lock feature that secures the trash bag to the rim of the wastebasket, thus preventing the said bag from slipping into the basket. May slide on certain types of surfaces. If you're not looking to add a touch of technology to your kitchen and to the way you dispose of litter, this product will fit you just fine. And if you're looking to put the wastebasket inside the drawer, there's no reason not to give this model a try. 17.25" x 14.9" x 25.5"
The material is better plastic when it comes to keeping rodents away. Plus, it doesn't absorb odors and is fully recyclable. It is also weather-resistant, meaning that you won't have to worry about rust. An offset bottom keeps the can steady and off the ground. A couple of side handles will help you carry the whole thing with a bit more ease. The steel is quite thin so the can might deform if you drop it. 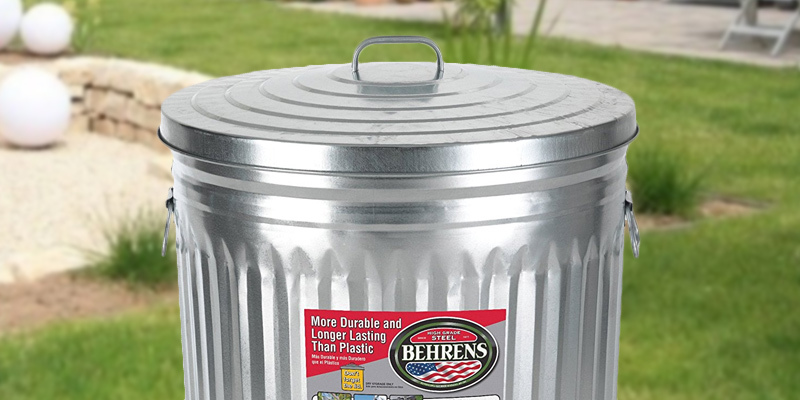 The Behrens 1211K will prove to be a good fit for people who need a durable and reliable garbage can for trash and yard waste. On top of that, the model's volume makes it suitable for storing some of the more edible food items. 17.5" x 17.5" x 23.5"
The can comes with a promo sticker that is hard to take off. The particular model from Home Zone doesn't necessarily bring anything new to the table but it is one of the better options for those who would be interested in a great combination of looks and functionality. 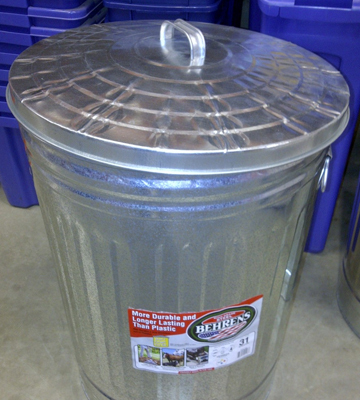 10.8" x 20.2" x 27.4"
Let's get one thing clear - a trash can obviously shouldn't be the centerpiece of your kitchen. But it certainly doesn't hurt if it fits the interior and looks as good as other elements of your décor. 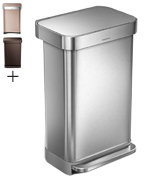 With that in mind, we would like to introduce the kitchen trash can with lid from Simplehuman, one of the more sleek options on this particular market. 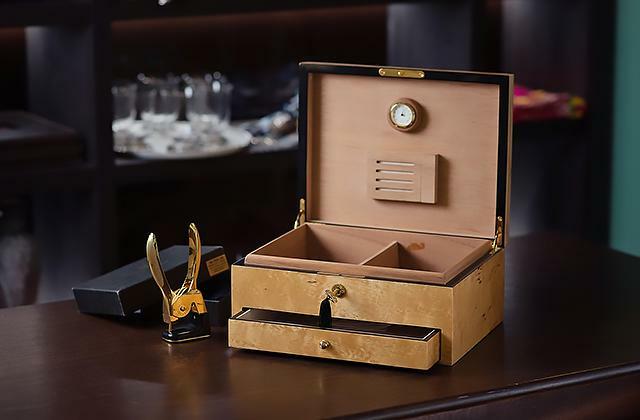 First things first, the whole thing is made of stainless steel with a nano-silver fingerprint-proof coating. 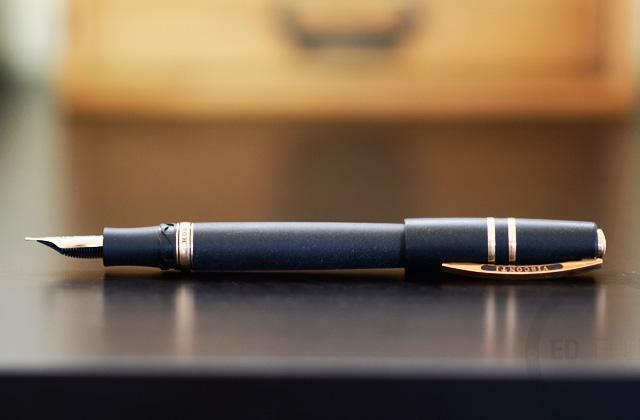 The former ensures the product's durability while the latter gives it the aforementioned good looks (though the fingerprint-proof part of the coating certainly doesn't hurt the durability either). On top of the material, the model features a couple of extra components that make it more useful and improve the already impressive aesthetics of the whole thing. There's a liner pocket inside the bin that conveniently dispenses the liners one by one, all while providing a nice little space for them. The liner rim flips down in order to secure the liner and hide its hideous edges from the outside world. Finally, there's the company's very own lid shox technology. 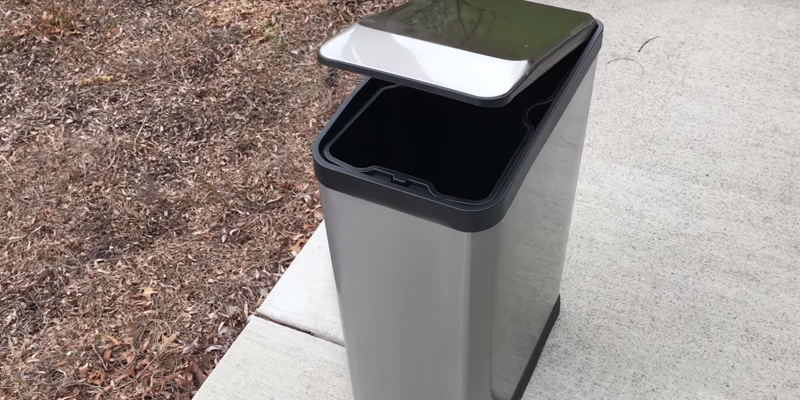 The technology controls the motion of the lid, making sure that it closes nice and slow so you won't have to experience those annoying banging noises every time you drop a piece of litter into this slim kitchen trash can. All things considered, there are a couple of things that define Simplehuman CW2024. First, there's the aesthetically pleasing design that will make it a good addition to contemporary and modern kitchen interiors. Then there are the additional features that make the product just a tad more convenient than the rest of them. Technological advancements make everything better. So why wouldn't they improve trash cans? We can't think of a single reason and, evidently, neither could the folks from iTouchless when they decided to come up with iTouchless DZT13/IT13CB. Now, it's not difficult to tell the difference between this mode and the absolute majority of kitchen garbage cans out there. The previously mentioned technological advancements manifest themselves here in a couple of things. First, there's the automatic lid that comes equipped with motion detectors. Aside from the fact that this little detail makes your interactions with the bin a bit more comfortable, it is also a much more hygienic choice for an obvious reason. The second high-tech element of this product is a natural carbon deodorizer. 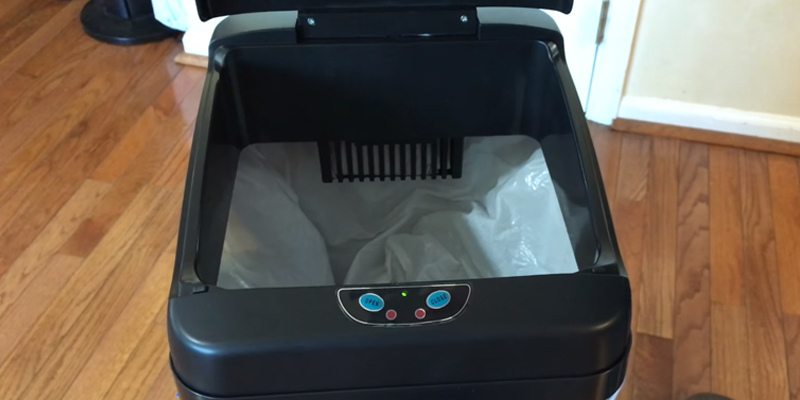 The filter absorbs and neutralizes trash odors, so you will be able to enjoy a fresh and clean smelling home regardless of what kind of trash you have in your bin. Of course, the whole thing requires batteries, but the product can run on just 4 D-size batteries for about 18 months. 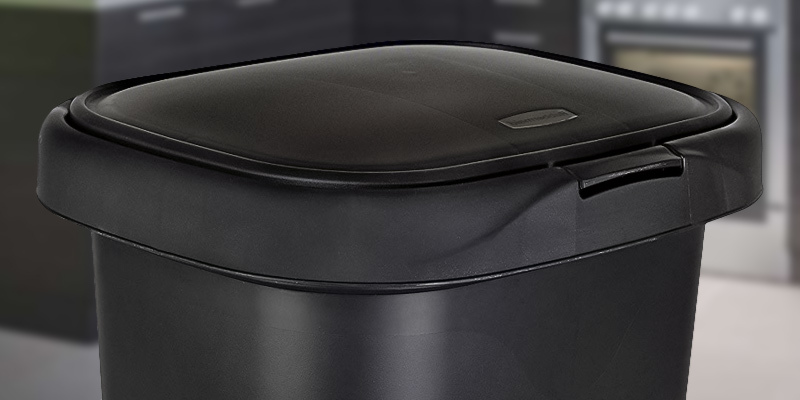 By the way, the unique Reflx™ technology quickly closes the lid but it doesn't produce loud noises and it won't snap your fingers as the infrared sensors will stop the motion if they detect any object between the lid and the basket. In conclusion, what we have here is obviously not your run-of-the-mill kitchen trash can. 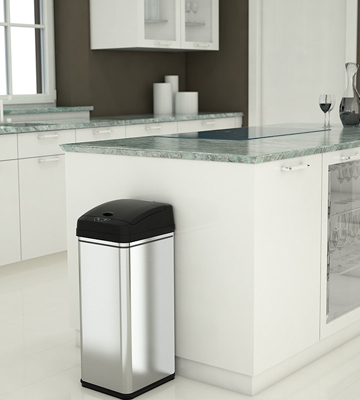 This is a high-tech model that brings the technological advancements to the element of your kitchen where you'd least expect it, making the necessary interactions with litter far less unpleasant and inconvenient. Not everybody believes that a trash can should just stay out in the open. 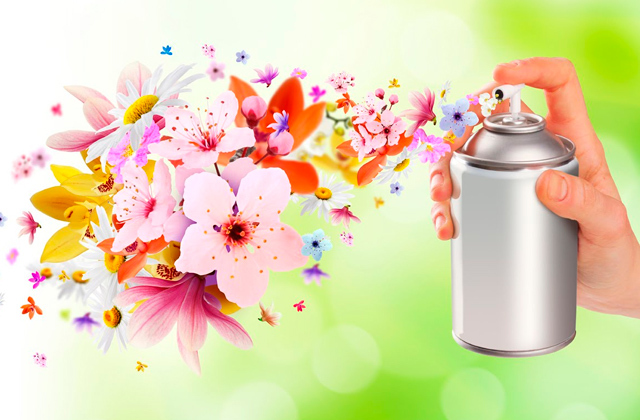 No matter how light the lid is, the odor will still escape the premises of the bin, making your kitchen smell less pleasant than you would like. That is where the black kitchen trash can from Rubbermaid comes in. The manufacturers behind it didn't bother trying to build some sort of a high-tech device or a sleek piece of interior. This is a simple wastebasket made of plastic that perfectly fits inside the right drawer. Of course, you can put it outside as well, but do keep in mind that it might slide on some surfaces. As we've said earlier, there's no high-tech gizmo here and the model includes only the most necessary elements of kitchen trash can design. There's an oversized button on top of the lid that conveniently springs that lid open, making way for easy disposal of litter. There's also a convenient liner lock feature that, surprisingly enough, locks the liners. Or, to be a bit more precise, secures the trash bag to the rim of the wastebasket, thus preventing the said bag from slipping into the basket. In terms of size and capacity, this is your typical trash bin, with 13 gallons of the latter and 17.25" (width) x 14.9" (depth) x 25.5" (height) of the former. All in all, if you're not looking to add a touch of technology to your kitchen and to the way you dispose of litter, this product will fit you just fine. And if you're looking to put the wastebasket inside the drawer, there's no reason not to give this model a try. The garbage can from Behrens can be used for a couple of things. Naturally, the first one is for keeping the trash and the yard waste. But the can is also great for storing dry produce, like seeds and pet food. Since the product features 20 gallons of capacity, you'll be able to store quite a lot of pet food in there. But, obviously, the volume will also come in handy for trash-storing purposes given that you will have to waste a lot less time taking the trash out. In terms of construction, the whole thing is made of sturdy galvanized steel. The material is better plastic when it comes to keeping rodents away. 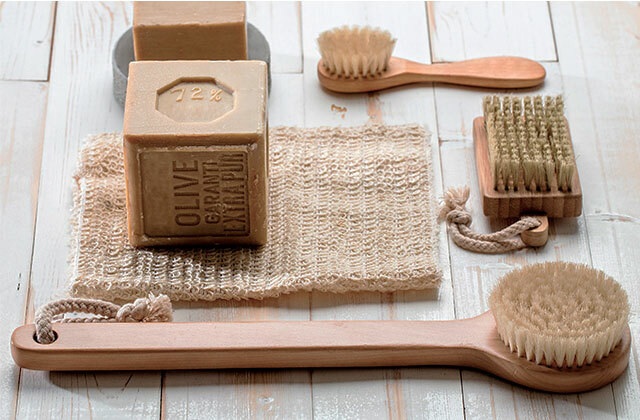 Plus, it doesn't absorb odors and is fully recyclable. 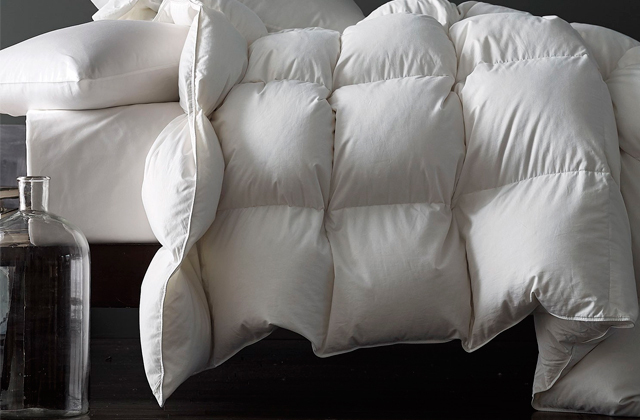 The whole thing is weather-resistant, meaning that you won't have to worry about rust. On the flip side, the steel is quite thin, so try not to drop the can or hit it as there's a chance that it'll deform. Other elements of the metal construction include an offset bottom that keeps the can steady and off the ground. A couple of side handles will help you carry the whole thing with a bit more ease and the top handle, oddly enough, will allow you to open the lid. 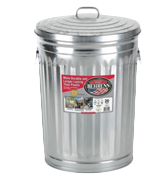 To sum it all up, Behrens 1211K will prove to be a good fit for people who need a durable and reliable garbage can for trash and yard waste. On top of that, the model's volume makes it suitable for storing some of the more edible food items. 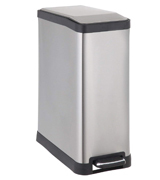 The model from Home Zone is another narrow kitchen trash can that does a pretty good job combining the functionality and an aesthetically pleasing design to make for a useful container and a rather attractive element of kitchen interior. Now, as far as looks are concerned, there isn't much to cover here except for the stainless steel construction that makes the whole thing durable and the fingerprint-proof silver coating that gives the model a really clean and polished look. 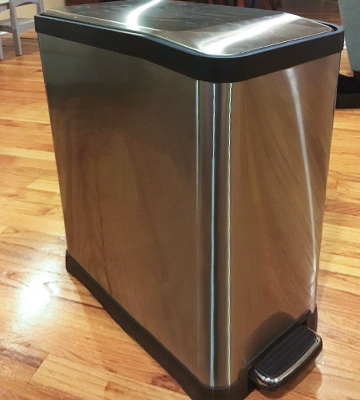 The standard 12-gallon capacity and the relatively standard 10.8" x 20.2" x 27.4" of overall dimensions (except for the height) further make this tall kitchen trash can a good fit for your average, nice-looking kitchen. Again, the particular model from Home Zone doesn't necessarily bring anything new to the table but it is one of the better options for those who would be interested in a great combination of looks and functionality. What Is a Kitchen Trash Can? "What is a trash can" sounds like a bit of a silly question. Nevertheless, you'd be surprised how much goes into constructing the right basket. First of all, the manufacturers of these containers try to take into account the way it'd interact with the owner and the trash can liner. In order to do to that, the people behind these products implement things like liner pockets and liner rims. 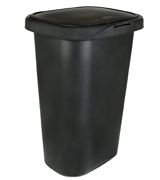 Other than that, a good wastebasket should include some sort of a "silent lid" solution that would allow the user to easily open and close that lid without having to deal with loud noises every single time. The capacity of the bin and the size of the whole thing go without saying. 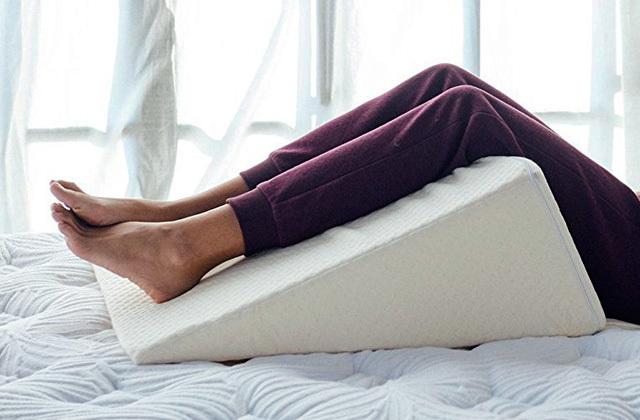 But you might also want to take into consideration the material as it is the driving force behind the product's durability and visual appeal (or lack thereof). 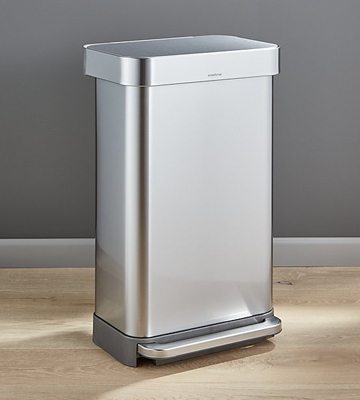 And if you're the kind of person who prefers a more modern touch, there are certain kitchen garbage cans out there that even include such high-tech solutions like motion sensors and natural carbon deodorizers. While we're on the subject of kitchen-related containers, you could also take a look at our reviews of lunch boxes and cooler bags.